Looks neat, and would be awesome if it came to be with the degree of customization fingerworks offered. I would think the biggest concern is the fact that they are making it in China. I say this because it seems like common knowledge that anything sent off to China is copied/stolen and used/counterfeited in China with consistency. Regarding patent infringement cases, I'd be more worried about a patent held by Microsoft for Kinect than a patent held by Apple for gestures. I should hope the gesture patents could be overturned in court if someone had the money to put up a fight, although I'm not a lawyer and could be wrong on that. Yes, you are right. When I posted this here I had not realised yet that it is a Chinese project and it raised the same concerns though I ended up backing it anyway. Reading through the description gave me the feeling it has a degree of customisation that other similar products (eg. Leap) lack, like eg. forget certain fingers altogether. That is something I currently miss on my TouchStream as one of my hands is 1/2 paralysed at the moment and the affected fingers tend to just land wherever without me noticing it. They've exceeded their original funding goal by over 10% in less than 6 days. Amazing. Now I'm a little more concerned about Apple. I didn't notice the retail value on the product was only going to be $70 either. Hadn't even heard of the leap motion. Have you used it? It doesn't look like it would do much for productivity. It would be awesome if the haptix would allow us to use the same gestures that we could use on a touchstream on a regular keyboard, but given the current patent environment, it'd probably be a whole new set. I bought a Leap Motion to try out and just returned it. The idea is interesting, but the current implementation needs a bit of work. Also, I think the Leap Motion would require a different UI than what's currently used. Waving one's arm and moving one's fingers, in mid-air, work better with large gestures that do not require the fine control needed by the current interface. It's also hard to know when you've triggered something except by what you see - there is nothing to touch against for feedback. Interesting about your experience, Nomaded. I wonder whether it will be the same with the Haptix; I hope not. 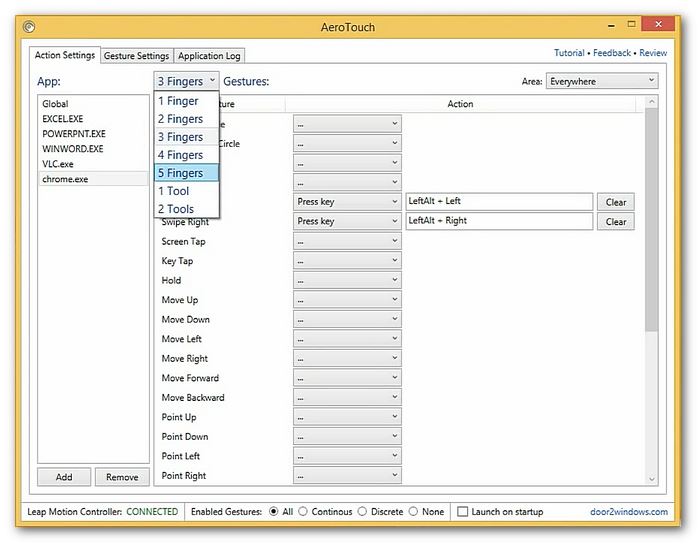 Have you guys seen the AeroTouch App for the Leap Motion device? To me, this looks almost as infinitely configurable as the MultiTouch Utilities by Fingerworks. One of the interesting parts (for me) of the Haptix will be the possibility of excluding fingers. Because the paralysis of my hand has advanced, I will need something that works with a 7 or less finger system. Thanks for the update. I forgot about this project, but I definitely want to hear how it works. I'm having problems with my right hand now that may not be RSI related, but if this lowered the stress in it in spite of that and helped, it would be wonderful. I was previously thinking it would only help in that I wouldn't have to use my thumb for my rollermouse anymore, but it just now occurred to me that it might be possible to program the thing to use a standard keyboard as a touch keyboard. I'm probably just dreaming, but that would be amazing. Let me know if this is a update for backers only but here they are talking about using the Haptix with the ASETNIOP method. I have also played with their software and I must say it is quite impressive to see how it recognises my fingers using just the iSight on my Mac. I know there is a Win version that might work even better but I am not sure I'd be allowed to pass on the URL. I asked them to open up their updates to people from this board or at least be allowed to give out some of the info that was shown in backer updates only. This way, you could make up your own minds. Thanks for the update! Doesn't look like it will be likely to do what I described out of the box, and maybe not at all since it can't look at the keyboard from a flat position and see all fingers. ASETNIOP sounds interesting, but unlike Dvorak, it's so not-standard that knowing it would be of limited use thus far (no chance of using it without specific input devices and software), and since chords would be used for letters, it seems like it wouldn't really support things like CTRL+(Letter), ALT+(Letter), SUPER(Win/Apple)+(Letter), and especially CTRL+ALT+(Letter) or SHIFT+ any CTRL/ALT combination previously mentioned unless it involved serial combinations like sticky keys. Still, any device that reduces impact and strain could potentially be very beneficial. Hah, just realised that they put quite a few videos, one using ASETNIOP, online. See ractivtech on YouTube. Update on this Haptix product: they delivered hardware which people deemed quality, but the software never worked. Even now, four years later, the Kickstarter page has comments from people looking for software that could make the hardware work well.